Within Task 54, researchers have conducted a survey among installers to find out about the main factors helping to reduce the cost of non-technical matters. One promising approach is the remote monitoring of systems. “With the assistance of smartphone apps that monitor the systems, installers can reduce their efforts for maintenance and suppliers can optimise their systems,” Saile said. Digital technologies may also change sales channels, as exemplified by Thermondo and Viessmann. Unfortunately, both companies are not partners in the project, which means that Task 54 has no data available on those changes. In addition to costs, the experts agreed that solar thermal has an image problem. They found that more targeted PR efforts and other awareness-raising activities will be needed to change the public’s opinion of solar hot water preparation. Three organisations based in Germany – ISFH Institut für Solarenergieforschung Hameln, KBB Kollektorbau and Narva Lichtquellen – have jointly developed a promising collector design that is said to create cost-saving potential for the entire system. The key is a specially designed heat pipe which limits the collector stagnation temperature to 125 °C to completely avoid vapour formation in the solar circuit. At ISFH, an evacuated tube prototype was tested and compared with a similar conventional collector. At a very short distance from the collector, the temperature remained below 100 °C in the new system while heat generation dropped by only a few percentage points. This could lead to lower costs of between 8 and 10 % for system components (such as expansion vessels and pipes), 8 to 10 % in installation (e.g., no further bleeding required) and 55 to 65 % during maintenance (slower degradation of heat transfer fluid). Overall, Bert Schiebler from ISFH believes that the costs of installed systems could be reduced by 20 to 30 %. Heat pipe-based flat plate collector systems show a potential reduction of 27 to 35 % in the levelised cost of heat (LCOH), according to IEA Task 54 calculations. The project has been funded by the German Federal Ministry for Economic Affairs and Energy. Further details can be found in the attached presentation. In the end, the impact of all these individual cost factors on the system will have to be evaluated. The most apt unit to compare the purchase price of solar systems is levelised cost of heat. Task 54 has developed not only a calculation method for LCOH, but also 13 reference systems. These systems are specified by parameters such as investment costs, operation and maintenance, years of operation and the amount or fuel saved by the solar installation. Interest rates, corporate tax, depreciation and residual value were set to zero. Stephan Fischer from the Institute for Thermodynamics and Thermal Engineering (ITW) presented calculations for several Austrian reference systems that include solar and an oil boiler (see table). Solar hot water preparation in a multi-family house (MFH) has already been shown to have a lower LCOH than the oil boiler in the system, which reduces the LCOH of the entire system (see the attached presentation). Solar hot water preparation in a single-family house is close to getting cheaper than preparation by means of an oil boiler, whereas combined solar space heating and hot water preparation systems remain quite far removed from being cheaper than the conventional oil-based solution. LCOH (excl. VAT) of Task 54 reference systems in Austria. For calculation details, see the presentation attached to this article. SFH / MFH = single-family / multi-family house. The reference systems and the calculation method have been published online (see the links below). That will enable not only project partners, but also other interested companies or research institutions to assess the impact of their low-cost components, more efficient sales procedures or other improvements in relation to overall system cost. A TRNSYS simulation is required for realistic high-quality comparison. Based on the above-described calculation method, Fischer has also analysed the sensitivity of LCOH to different factors (see chart). 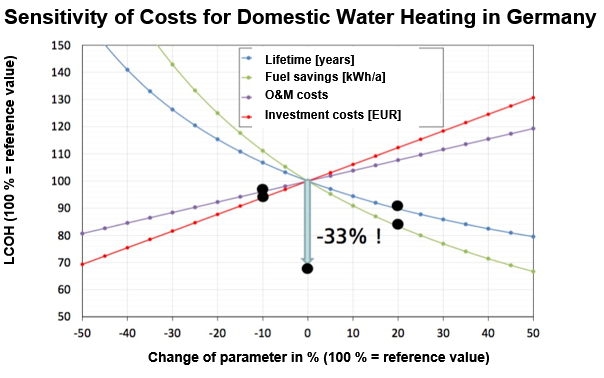 LCOH could be reduced by one-third in the case of a domestic hot water system installed in Germany when combining 10 % lower investment with 10 % lower O&M costs, 20 % higher fuel replacement and 20 % higher lifetime. These calculations are part of the German project KoST (Cost reduction in solar heat by standardised components and interfaces). ITW’s sensitivity analysis: Improving several cost factors will make it possible to reduce heat costs by 33 % in total (see p. 20 of the attached presentation). 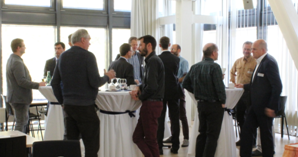 The first calculation results based on the LCOH cost reduction method by means of innovative system design will be presented at the next workshop on 26 April 2018 at Sophia Antipolis, France.